The Main House is a grand light and airy, classically stylish, wedding venue that reflects the endless stunning vistas out to sea. Contained within are a selection of individually designed, boutique rooms all offering a different backdrop for any size wedding from two to two hundred, for something more grand the entire house and rooms are available for exclusive use. Walk down the aisle beside sub-tropical gardens; following celebration drinks in the elegant bar or outside on the terraces, your wedding breakfast will be created by our award-winning Head Chef, then dance the night away and enjoy a very popular hog roast with all the trimmings or an evening buffet of Cornish fish and meats. The Sands is yours for the day but don’t forget the lure of the ocean and those winning photos. The Godrevy Room is a stunning conservatory within the Hotel with panoramic sea views across St Ives Bay. With plenty of light and a high ceiling, it presents itself as the perfect blank canvas in which to personalise your ceremony. Process towards the sea for your ceremony – your guests will be overawed by the location – and say your vows against an ocean backdrop. Above the Spa gardens and pools, looking out to sea, is our pretty Pavilion, setting the scene for an intimate wedding ceremony. It is also perfect for celebration drinks or an afternoon tea with bubbles – even a relaxing spa treatment before your wedding. Explore our range of accommodation available for all your wedding guests. Simply stunning, our award-winning C Bay Spa is the place to head for serious pampering. 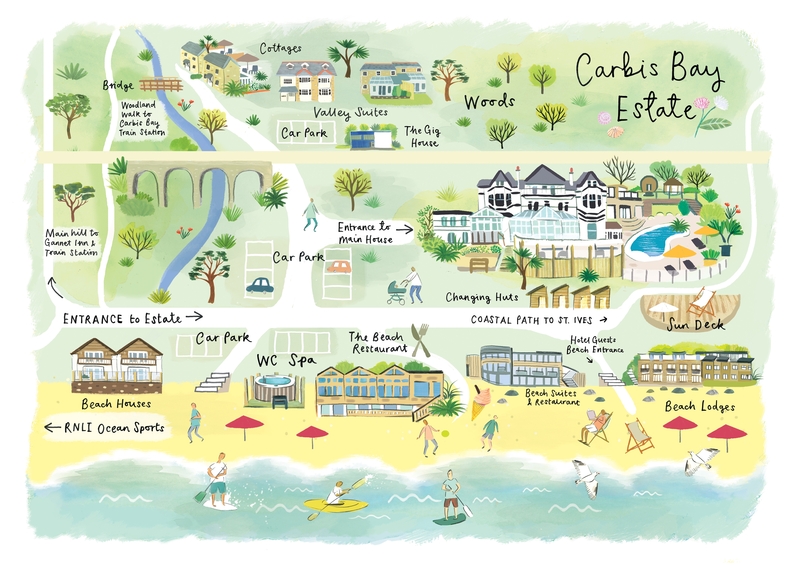 Artist Claire Rossiter has created a map of the estate, now available as postcards.